The holidays are upon us and many of us will be hosting family or friends at our house this season. But in the midst of all the planning and anticipation that goes into entertaining, there’s one thing that’s easy to forget—making your house safe for your visitors. Safe? Well, of course my house is safe, you may say! And overall, this may be true. Sort of. But shoveling the front walk and using antibacterial spray to clean your kitchen isn’t enough. You need to take a good look around and prepare your home to meet the needs of the guests that will be stopping by. When you live in your house day in and day out it’s easy to overlook the things around you. But there are several reasons why you may need to do a little safety-tweaking at home! 1. If you’re a new homeowner. Put any medication in high cupboards. If the grandchildren are toddlers or older, make sure the meds are actually locked away. Put gates across any steps or stairways to prevent young children from falling down them. If you have any bikes for the kids to ride, be sure you have helmets as well. Move breakable objects out of reach. Lock up any cleaning products or other things that may be poisonous. Use kid locks to secure cupboards. Put plastic caps in electrical outlets so little fingers – or tongues – can’t explore the openings. Be sure that any cribs or other baby products meet today’s safety standards. Put padding over any sharp table corners. Don’t let tablecloths hang low where they can be grabbed—causing food, dishes or decorations to come crashing down. Keep kids away from fireplaces. 3. If you’re a pet owner (or have guests planning to bring along their cats or dogs). Your own pets (or visiting pets) may seem pretty indestructible but that isn’t always the case! And remember—they rely on you to keep them safe. Beware of poisonous plants such as holly, mistletoe, lilies and poinsettias. Keep pets away from your Christmas tree—or anchor it down. Watch out for poisonous foods. You may love chocolate (who doesn’t?) but it’s toxic for dogs (and cats). So are grapes, raisins and peanut butter made with xylitol. Keep medicine under wraps. Even Tylenol and Advil are dangerous for our furry friends. Don’t give pets too many treats or table scraps. And contrary to what you may have seen in the movies, milk is not good for cats and kittens. 4. When your senior parents or grandparents need some extra help. If elderly parents, relatives or friends are visiting, be sure they have easy access to the house. Make steps as easy as possible to navigate. Is there a better way to get into the house than the front door? If seniors are staying overnight, leave a nightlight lit in the hallway and bathroom so they can see their way around in the dark. Make sure that bathtubs or showers have grab-­‐‑bars. Offer your senior guests a chair that’s easy to get in and out of. Keep an eye on children or pets that may run, jump or climb on seniors. Be aware of any dietary restrictions and prepare food you know they can eat. Be sure to take these seasonal and holiday precautions to keep both your company and your family safe and sound. Candles – keep them away from all flammable objects, place them toward the back of counters, and be sure to extinguish them when going out or to bed. Never leave candles unattended. Be aware of guests’ food allergies. 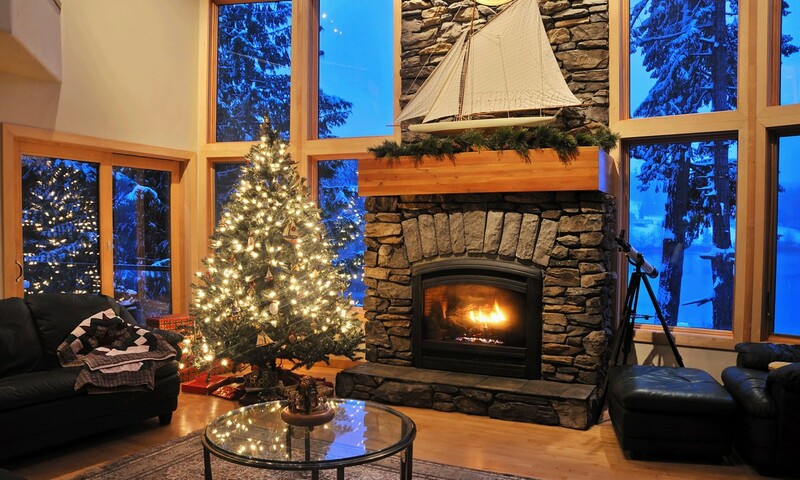 Water your Christmas tree daily so it doesn’t dry out – and keep trees away from heat registers, stoves and fireplaces. Have your furnace and chimney inspected before winter use. Put salt on icy walkways so your family, your guests and delivery people won’t fall. With these simple tips and tricks, you’re sure to have a safe holiday! Unfortunately, we can’t stop Aunt Mildred from giving you another hand-made reindeer sweater!